The design and features covering the Lil Tex grill makes the whole thing so trendy and admired by a lot of users. It comes with a surface area for cooking of 418 square inches which can cover more than that of a standard family size. The fully automated burner just works well together with the electronic autostart where you don’t need any matches to get started. The control system feature also allows its user to control the heat of the griller to either slow, medium, or high. What makes this grill more flexible? It has an easy drain grease system and it is also very easy on the pocket. The griller is simple to assemble which won’t take more than a couple of hours and at the same time you won’t get any difficulty starting with its electronic Autostart and automated burner. Once you are all set, you can start cooking and expect perfect cooking using this griller considering its taste and texture. Other than that it is also very safe to use because there is no direct fire and unexpected flare ups. When you are done with the whole cooking job, this grill is very easy to clean. It works just so right for any outdoor activities with its great quality and durability. 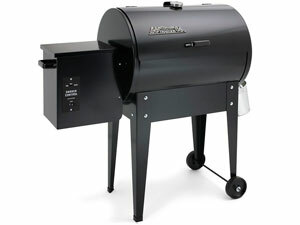 The concerns raised were focused more on the design of the griller. After two years of use, the igniter failed to work. The controls were broken also including its hinges. Other parts like the grease collector, doors and others just do not work well anymore after quite some time. The grease drain does not work well since the oil or grease just drips out of the griller which is very messy. The paint and its coating were also found to shed off after a couple of months use and exposure to heat. It was also noticed that the temperatures do not exactly function well; it was found to be inconsistent with the control knobs and do not provide the heat expected for cooking food. Tendency is the food is not cooked well and it will take quite a lengthy time to finish the whole cooking job.